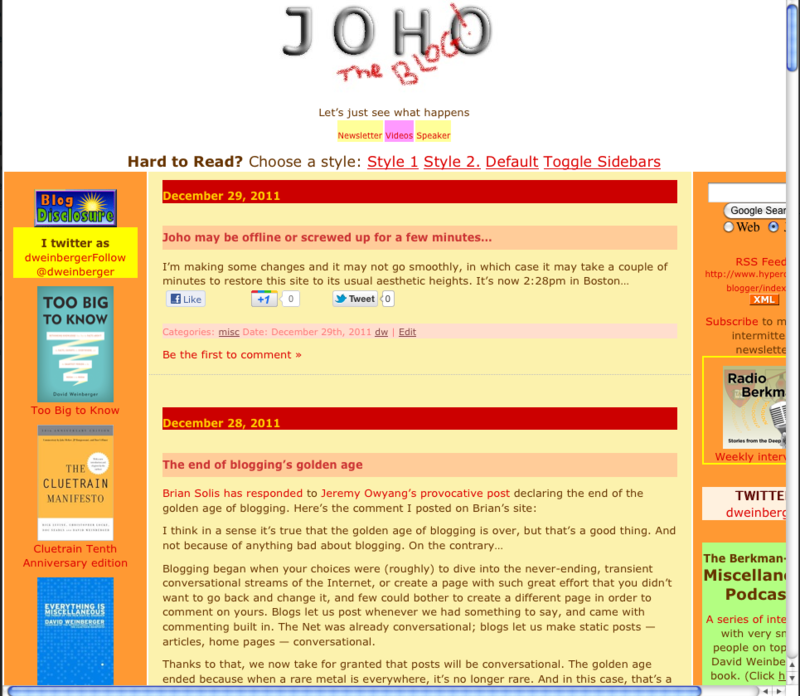 In the recent — and probably unabated — unpleasantness attending the launch of the update of this blog’s look, I have learned a little about Quirks mode. I learned this because Internet Explorer 9 was not displaying rounded corners or laying out divs (blocks of content) the way Firefox and Chrome were. 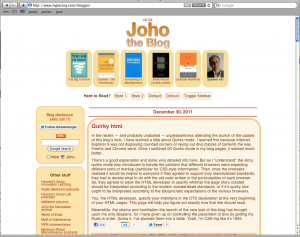 Once I switched off Quirks mode in my blog pages, it worked much better. There’s a good explanation and some very detailed info here. But as I “understand” the story, quirks mode was introduced to handle the problem that different browsers were expecting different sorts of markup (particular for CSS style information). 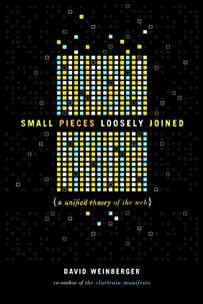 Then, once the browsers realized it would be helpful to everyone if they agreed to support truly standardized standards, they had to decide what to do with the old code written in the particularities of each browser. So, they agreed to allow the HTML developer to specify whether the page she’s created should be interpreted according to the modern standardized standards, or if it’s quirky and ought to be interpreted according to the idiosyncratic expectations of the various browsers. You, the HTML developer, specify your intentions in the DTD declaration at the very beginning of your HTML pages. This page will help you figure out exactly how that line should read. Meanwhile, the shame and humiliation the launch of the new look of this blog has brought upon me only deepens, for I have given up on controlling the placement of divs by getting my floats in order. Screw it. I’ve plunked them into a table. Yeah, I’m CSS-ing like it’s 1995. 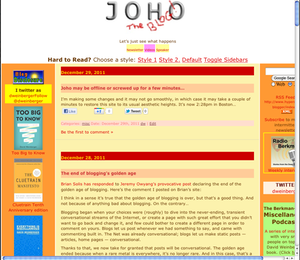 So, instead of painting our house over the break, I started making some tweaks to Joho’s “design” that have resulted in a complete overhaul, the first since the site opened its shutters in the year of their lord mumble mumble. Click on the image to be reminded of what it used to look like in all its former glory. There are certainly going to be many bugs, rough edges, and further uglinesses to blast with a buff-colored paint gun. But, I hope it’s better. Yeah, you’re right. It needs more orange. Doesn’t everything? 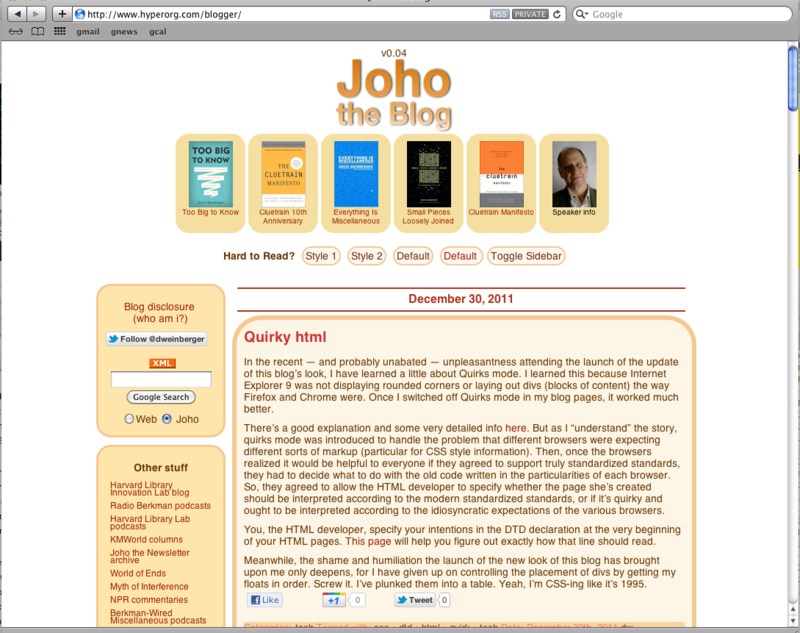 Here’s the way the page currently looks to me (Dec. 30) in Safari, which is pretty much how I intend it to look. You are heading out of some institutional building that has the typical double glass doors that open where they meet in the middle. Someone else is coming toward the building, about to enter. You do the polite thing of pushing open the door on your side, smiling at the person coming in, welcoming her to use the door you’ve opened. She does exactly the same thing with the door on her side. Each of you uses the doorway you’ve opened. No one accepts the offer of the open door. We have had our hopes extinguished hundreds of times. Yet we persist. No spoilers in this. In fact, my aim is to undo a false expectation about “Hugo” that may be keeping you from seeing this amazing movie. “Hugo” is not about robots, animatronics, or a boy’s relation with a mechanical man. An automaton is an important part of the plot, but that’s not what this movie is about. BTW, “Hugo” is the boy’s name. The automaton doesn’t even have a name. There are lots of reasons to like it because it works at many levels. Those levels are resonant, and deepen through their redundancy. Also, Chloe Moretz is in it, whose talent as a young teen already can only be measured in streeps. But mainly I loved this movie because — in a way that is itself redundant with the movie’s content — the filmmaker’s technique turns it into an artwork. Martin Scorsese takes us through a movie that emotionally and aesthetically feels like one long tracking cut, although of course it isn’t. Most movies are constructed as a series of scenes. While “Hugo” has different settings and scenes, it plays without interruption. It’s the difference between traveling by plane and traveling by foot: Scorsese leads us along a path, sometimes walking, sometimes running, but it’s one continuous landscape. Crappy metaphor, but “Hugo” is as close to perfect movie construction as I’ve seen. movie that makes the most of what a movie can be: so limitless in its ability to move us through spaces, so able to show us what’s going on inside by showing us surfaces, that it is the medium best suited to dreams. (as Norman Mailer once observed). So, now let me de-hype it. “Hugo” is a wonderful movie, but it’s a small movie. I understand those who see it as sentimental. There are a couple of moments that don’t work. But I woke up thinking about yet more ways in which the movies scenes’ and ideas not only work together like a clock mechanism (you learn early on that Hugo winds the clocks in a Paris train terminal, so he is in effect part of that mechanical system), but reflect upon one another as analogies and correspondences in the Medieval sense…and this is too is what the movie is about. So lower your expectations from this review and go see “Hugo” before the new Chipmunk movie pushes it off the big screen. [2b2k] Is HuffPo killing the news? Mathew Ingram has a provocative post at Gigaom defending HuffingtonPost and its ilk from the charge that they over-aggregate news to the point of thievery. I’m not completely convinced by Mathew’s argument, but that’s because I’m not completely convinced by any argument about this. It’s a very confusing issue if you think of it from the point of view of who owns what. So, take the best of cases, in which HuffPo aggregates from several sources and attributes the reportage appropriately. It’s important to take a best case since we’ll all agree that if HuffPo lifts an article en toto without attribution, it’s simple plagiarism. But that doesn’t tell us if the best cases are also plagiarisms. To make it juicier, assume that in one of these best cases, HuffPo relies heavily on one particular source article. It’s still not a slam dunk case of theft because in this example HuffPo is doing what we teach every school child to do: If you use a source, attribute it. But, HuffPo isn’t a schoolchild. It’s a business. It’s making money from those aggregations. Ok, but we are fine in general with people selling works that aggregate and attribute. Non-fiction publishing houses that routinely sell books that have lots of footnotes are not thieves. 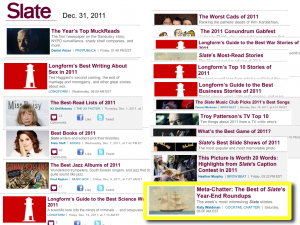 And, as Mathew points out, HuffPo (in its best cases) is adding value to the sources it aggregates. But, HuffPo’s policy even in its best case can enable it to serve as a substitute for the newspapers it’s aggregating. It thus may be harming the sources its using. And here we get to what I think is the most important question. If you think about the issue in terms of theft, you’re thrown into a moral morass where the metaphors don’t work reliably. Worse, you may well mix in legal considerations that are not only hard to apply, but that we may not want to apply given the new-ness (itself arguable) of the situation. But, I find that I am somewhat less conflicted about this if I think about it terms of what direction we’d like to nudge our world. For example, when it comes to copyright I find it helpful to keep in mind that a world full of music and musicians is better than a world in which music is rationed. When it comes to news aggregation, many of us will agree that a world in which news is aggregated and linked widely through the ecosystem is better than one in which you—yes, you, since a rule against HuffPo aggregating sources wouldn’t apply just to HuffPo— have to refrain from citing a source for fear that you’ll cross some arbitrary limit. 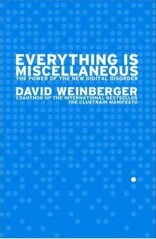 We are a healthier society if we are aggregating, re-aggregating, contextualizing, re-using, evaluating, and linking to as many sources as we want. Now, beginning by thinking where we want the world to be —which, by the way, is what this country’s Founders did when they put copyright into the Constitution in the first place: “to promote the progress of science and useful arts”—is useful but limited, because to get the desired situation in which we can aggregate with abandon, we need the original journalistic sources to survive. If HuffPo and its ilk genuinely are substituting for newspapers economically, then it seems we can’t get to where we want without limiting the right to aggregate. And that’s why I’m conflicted. I don’t believe that even if all rights to aggregate were removed (which no one is proposing), newspapers would bounce back. At this point, I’d guess that the Net generation is primarily interested in news mainly insofar as its woven together and woven into the larger fabric. Traditional reportage is becoming valued more as an ingredient than a finished product. It’s the aggregators—the HuffingtonPosts of the world, but also the millions of bloggers, tweeters and retweeters, Facebook likers and Google plus-ers, redditors and slashdotters, BoingBoings and Ars Technicas— who are spreading the news by adding value to it. News now only moves if we’re interested enough in it to pass it along. So, I don’t know how to solve journalism’s deep problems with its business models, but I can’t imagine that limiting the circulation of ideas will help, since in this case, the circulatory flow is what’s keeping the heart beating. [A few minutes later] Mathew has also posted what reads like a companion piece, about how Amazon’s Kindle Singles are supporting journalism. Ok, so the title of this post grossly overstates the findings of Kevin Lewis, Marco Gonzalez, and Jason Kaufman who analyzed how tastes spread among friends on Facebook, at the one college they were able to study. Still, it’s interesting data, and I enjoyed interviewing Kevin Lewis about it for this Berkman podcast.